While the producers are starting a road tour and are in discussions about a production at the National Theater in London, five members of the 13-person Broadway cast will be new at the first post-Tony performance on Tuesday night. Sunday — the day of the awards — was the last day of in the original-cast members’ contracts, an extension made several months ago to keep everybody on board through the Tonys. Among those who have left the production are the two actresses, Rondi Reed and Deanna Dunagan, who won Tony Awards. That's right, five new actors starting tonight. Including Estelle Parsons stepping into Dunagan's role as the matriarch. Parsons is a fine actress with a great history--but I just hope she's up to it, given her advanced age and having not been on stage for a while, I believe. But overall the replacements I know of are fine, fine actors, including Frank Wood and Steppenwolf vet (and Wire player) Jim True-Frost. This and more from Campbell Robertson's definitive NYT Tony post-mortem, including some crucial stats. "The Tony ceremony’s ratings were just as good as last year’s," for instance. Do you hear a "but" coming...? ...but last year’s were the lowest in Tony broadcast history. According to preliminary Nielsen ratings, the ceremony drew around 6.2 million viewers, leaving CBS in third place among the networks for the night. While the record set last year was the result in part of the broadcast’s unusually stiff competition — the last episode of “The Sopranos” on HBO — stuff seems to always happen on Tony night. This time the ceremony was competing in its first hour with one of the more exciting United States Open golf tournaments in recent years, and in its second and third hours with a Lakers-Celtics slugfest in the N.B.A. finals. You hear it here: Golf, more exciting than theatre. Sadly, so true in America today. The whole speech was like that, eliciting some rather entertaining reaction shots. As it turns out, the speech was a prose poem by a Minnesota writer named Lewis Jenkins. 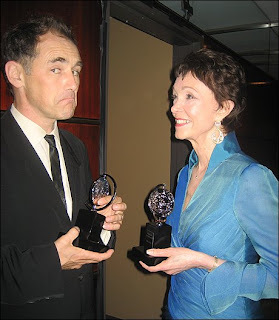 Mr. Rylance also quoted Mr. Jenkins at the Drama Desk Awards last month. Mr. Rylance told the show’s press agent that he was not going to be answering the telephone on Monday. This ain't going to help win more time for acceptance speeches next year, unfortunately. It's tempting to extrapolate more "death of the theater" headlines out of the ratings results for the Tonys. But, hey, have you SEEN "In the Heights?" I'd rather watch basketball any day. When Broadway can produce something that rivals Tiger Woods for sheer drama, inspiration, inclusiveness, accessibility, and joy, that's when people will watch the Tonys again. Until then, all we can do is scratch our heads over why CBS even bothers every year. I found the Rylance acceptance speech to be the most interesting part of the ceremony, especially considering how the audience reacted to seeing a genuinely theatrical moment in an otherwise over-produced and entirely bland event. I agree with G. Lane (and I'm sure Brecht would have agreed as well): if the Tonys represent theatre in America, I'm not convinced that theatre deserves to be more important than golf or basketball.